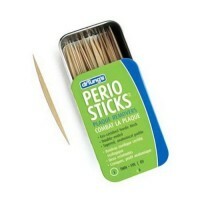 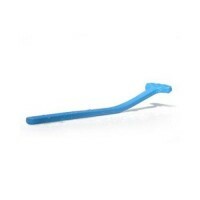 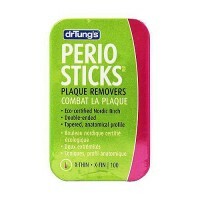 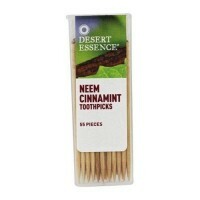 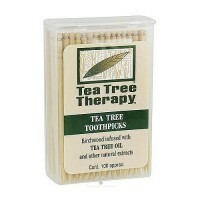 This lighter and smoother wax helps GentleFloss glide more easily between tight teeth contacts. 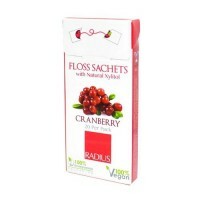 All floss is not created equal! 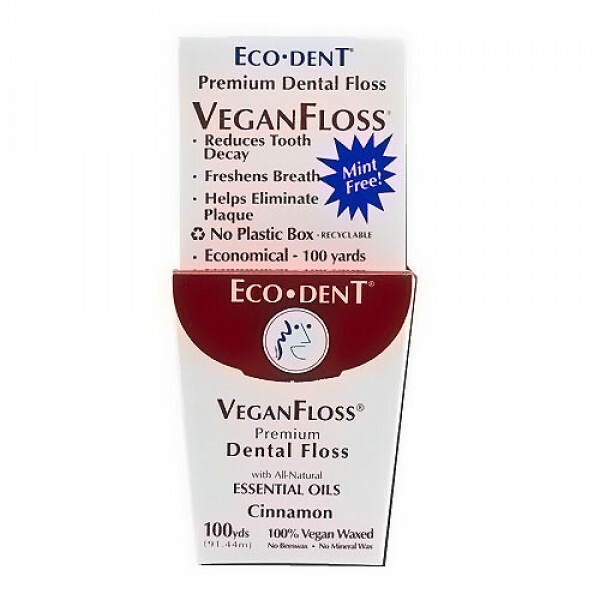 Eco-Dent floss is not only the most economical floss, but it has real benefits, such as being vegan waxed, and made with a blend of natural essential oils and enzymes to reduce plaque and help you maintain healthy teeth and gums. 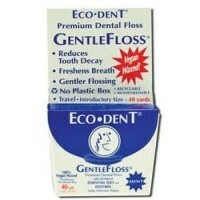 Eco-Dent packages their floss in a cardboard carton rather than a plastic case to cut down on ecological damage done by plastic and the disposal of plastic. 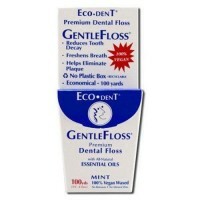 Gentle Floss Premium Dental Floss. 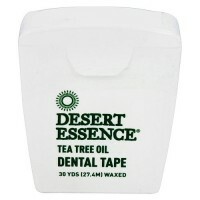 treated with enzymes and 14 natural essential oils.Vegan waxed using rice bran. 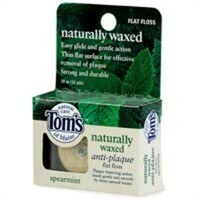 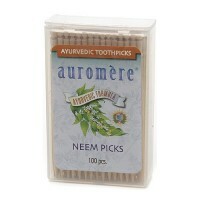 the only floss waxed with 100% vegetable waxes. 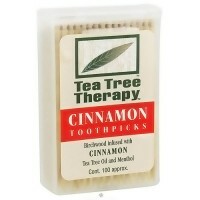 no beeswax. 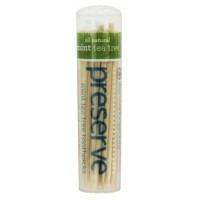 This lighter and smoother wax helps GentleFloss glide more easily between tight teeth contacts. 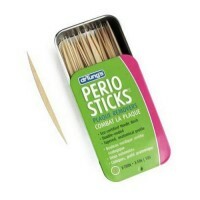 Nylon, not silk. 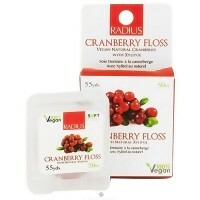 Silk production involves chemical sterilization and can be dangerous and involve child labor. 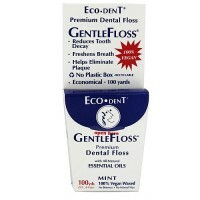 Nylon is clean and effective as a floss, without these problems. 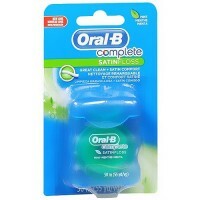 Refreshing, long-lasting clean mint taste. 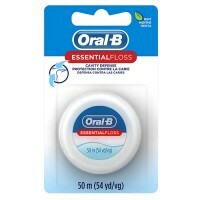 100% vegan-waxed floss inpregnated with cinnamomum cassia leaf oil, anethole, melaleuca alternifolia (tea tree) leaf oil, citrus aurantium dulcis (orange) oil, citrus medica limonum (lemon) peel oil, foeniculum vulgare (fennel) oil, illicium verum (anise) oil, pelargonium lavandula angustifolia (lavender) oil, rosmarinus officinalis (rosemary) leaf oil, ocimum basilicum (basil) oil, rose flower oil. 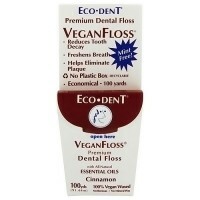 Floss daily with Eco-Dent VeganFloss.